piggielover, the pellets will not kill your pigs. But when things taste different, sometimes pigs will go off their feed and not eat. This (not eating) would be the biggest problem in feeding something different on a temporary basis. E would throw them out. I'd give them some until I got another brand and watch their weight carefully if it is going to be a few days. I have gone without food already. I was waiting for my oxbow to get in, but it didn't come in on time. I ended up grabbing some L&M at the petstore, and feeding that to hold them off. I didn't have any problems with the quick switch over. I however did already just give them a lot more hay and veggies, and that held them off just as good. I would have personally gone with no pellets for a few days, with lots of hay and veggies. Hm, I haven't bought it but I can go to the store and write down the info that's on the bag to call them. I'll tell you. Okay, I'm going to move this to the reference forum. If anyone else has any pellet analyses to add, go right ahead. I also finally got Josephine's guidelines incorporated into the nutrition page. P.S. Let me know if you would prefer to be referred to by a name other than Josephine. Ok, I finally bought the alfafa pellets as the cavy ones I had ordered they couldn't get hold of - so, it says "100% pure alfafa - no additives" and it's labelled for rabbits, goats, ponies ... I asked the woman if she was sure there were no antibiotics in there and she said "yes I'm sure, the other rabbit food we sell has some but not this one". So I think it's OK ? And I don't know how they get the pellets to hold together ! BTW, I also bought a straw pellet bedding and it's pure straw with no additive, neither. Well, I would be inclined to believe them if they say there are no additives. If they are only alfalfa pellets, be sure to provide hay all the time (a variety of hay is good if you can get it -- timothy, orchard grass etc.) and lots of different vegs. Most pellets have vitamin and mineral supplements added. These pellets will have none. So you want to try to ensure your pigs get all the nutrients they need. See www.guinealynx.info/nutrition.html for more information on needed minerals and vitamins (link to another site). Thanks, Lynx. I just saw the nutrition stuff. Cool pages. I don't care I guess, about the name thing. Josephine is fine, I suppose. I could go either way. Maybe both? Then I think I'll leave it as 'Josephine' for now (perhaps awkward to list two names). Should you ever want it changed, let me know. I really appreciate your having posted these guidelines. They make sense and give people something concrete to refer to when looking for pellets. Sticking it on the nutrition page should mean it won't get lost on the forums. Glad you like the pages. People who are really interested in nutrition will have to do their own research (I can't begin to cover this truly complex subject). But it's important to know the quality of the food you feed really does make a big difference in the health of your animal. The nutrition book I refered to on the hay page (more charts of different hays www.guinealynx.info/hay.html ) discussed many diseases related to vitamin and mineral deficiencies (each with their own name) and some that had to do with the Ca:P ratio in large animals. Note, on the first page I added info on Hartz Guinea Pig pellets. Thanks for adding the Hartz to the pellet nutrition page. Since Hartz does not list the pellets as having Ethoxyquin in them does that mean they don't have it in them then? I am just curious on how bad these pellets are because my pigs REALLY liked these pellets more than the KayTee forti diet. If anyone can let me know how they compare to KayTee I would appreciate it. Some of the ingredients are way over my head. Take a look at Josephine's guidelines. I think it is a mark against them that they do not list alfalfa first. You have the bag, too, so you can go over the ingredients one by one if you want to. Is there a freshness date on? So you know how long the vitamin C is viable? That could be a mark against them too. Kaytee makes a stabilized form that lasts longer. And yes, I would imagine if equitoxin(?) is not listed, it isn't in it. 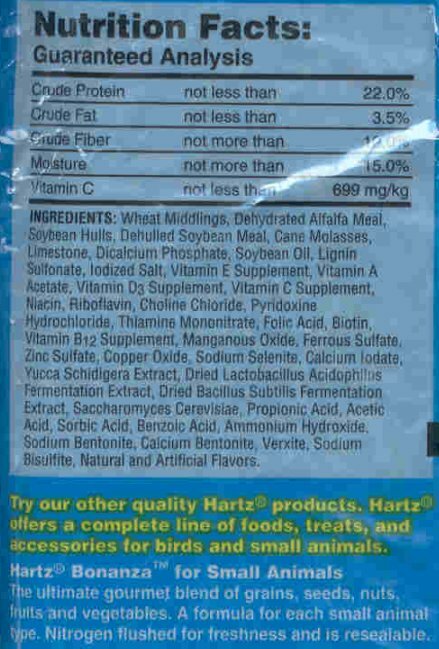 Hartz also has animal fat and products. Very poor feed. Are the ingredients somewhere and I'm missing them? Edit: I found it in the middle of the first page. They must have changed the ingredients--again! That's another thing you have to look for. Many companies regularly change the ingredients depending on which ingredients are cheap and available in quantity at the time. The feed based on wheat, tons of soy, oil, etc. is still not healthy for cavies at all, but it does look like the animal products and ethoxyquin references are removed. Maybe they found a way to put them in without listing them (like finding an ingredient with them already added) or maybe they've gotten smart and removed them altogether. Either way, the rest of the ingredients are still not as high-quality as the other feeds on the list. I am planning on sticking to Forti diet and not Hartz. I just found it strange that they ate more of the Hartz than KayTee. It could be because they are just hungrier on the Hartz and it is not filling them up like KayTee. Your pigs like Hartz better for the same reason most kids will choose a McDonald's hamburger over healthy meals. HARTZ foods I noticed (several names to diets)--all contained animal fat, products, oils, high wheat products (leftovers), and ethoxyquin. Some have colorings, seeds, and nuts. I wish I had the time to do a listing of ingredients. I refused to buy it, even to fertilize my garden. I wonder what food the listing Lynx posted had those ingredients since I was unable to find anything similar to that when I looked at the Hartz foods this weekend. GEISLER foods (Sargent's pet products)--animal fat, oils, wheat products, and ethoxyquin again (are they owned by Hartz?). Some with colorings, seeds, and nuts. VITAKRAFT/GERTY seem to be in similar modes, but I do not remember all of the details. More to come when I get official ingredients listings. I would not recommend ANY of the feeds in this post. They are all low-quality and mediocre at best. Choose one of the other ones listed previously. Also not recommended was a treat I saw. Brightly colored treats called Tasty Twigs and suggested by the manufacturer to be chewing exercise. They are nothing but flour, oil, sugar, and food colorings. Not healthy. Hay is much better for chewing exercise. What I saw at the stores was depressing. Very poor feed. Please don't waste your hard-earned money on this garbage. I wonder if there are different suppliers for Hartz products in different parts of the country. There might be. So that was "Hartz Bonanza." I don't think I saw one with that name. I wish I had a digital camera to photograph all of the diet labels. Most of them are not on the net. No, it is supposedly HARTZ GUINEA PIG PELLETS. If you look at the pic, it says "other producst" or something similar. I cropped out the reference to bedding. Left one so you'd know it was indeed Hartz. Yes, Lynx your right. It said just HARTZ Guinea Pig Pellets on the front of the bag in blue. All pellets and no fruit or nuts. I DID see the bonanza there too. I threw the bag out so I can't send a picture of the front. It is at Walmart though, here anyway.